Juba/New York, May 24, 2017 (SSNA) — The United States and the United Kingdom said South Sudan’s President recent declaration of the unilateral ceasefire is not new, saying Kiir is simply repeating the same promises he previously announced. 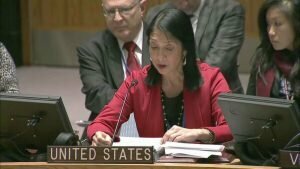 United States’ deputy Ambassador to the United Nations, Michele Sison, blasted Kiir’s announcement, saying South Sudanese President had told leaders of the Intergovernmental Authority on Development (IGAD) the same promise two months ago. She added that Kiir declared a ceasefire after his forces carried out attacks in many locations. UK Ambassador to UN Matthew Rycroft also said Kiir’s ceasefire is not convincing. The US and Britain also urged other council members to support UN arms embargo on South Sudan. Russia said an arms embargo would not solve anything. What ceasefire do US and UK wants from salva kiir? UK and US accussation against kiir government is not anew culture. You don’t know what Us and UK mean because of bad ideology of you dinka community you can put blame on Us and UK, yes of course Kiir has declared many ceasefire and no implementation and with in the same time of declaring his and he order his militias militant to attack opposition. So you thought that you can deceive the western world, they know what is going on. You dinka you will regret very soon and make sure that in the end of your tribal government you people will regret soon because we knew that what makes you to lies is ideology of hatred but soon South Sudan will United again under new leadership who can unite them and treat them as a one people. Who are US and UK? It’s nonsense to intimate atmosphere of the south Sudanese politics simply their Embassies can be close and call back our ambassadors from their cities this would not stop rain in south Sudan! Thomas you are more than stupid I don’t understand why you don’t accept that Kirr is an illiterate president who has nothing to offer other than maintaining himself in power through wars of tribal nature? Thomas, what can I compare you to but to a hateful tribalistic idiot who see South Sudan only as belonging to the jenge tribe only. Know what, it doesn’t matter long the struggle for nationhood will take, be assure that South Sudanese will one day be free from Kiir, Whom you think leaves and rules forever. As far as I know, governments or leaders comes and go. I can assure you he will to go. Kiir needed to step down or need to go! There is too much bloodshed and distribution genocided around the country. To the the president Salva Kirr, please steps down, you are not qualified to take the country any further. Person like President Salva Kiir couldn’t be trusted since he always keep repeating the same things every time he decided to say something. If not because America is only fear or solved problems of countries those exports Terrorist and oil, South Sudan’s problem would have been solved since J1 fighting. The world should not consider all the layer words of salva kir,those of taban deng and salva kiir they are just agroup of thief who gather themself to loot the nation resources, for themselves. When a dog vomit we are sure it will do the same in few seconds. It was lack of knowledge to president kirr to govern the country. I support the view of the US and UK. Kiir has made several broken promises before, what will be different this time around? The only reasonable thing the establishment must do is to accept that they have failed the aspirations of South Sudanese and hence they must step aside and S. Sudan to be underUN trusteeship for the citizens to have a breather. South Sudanese leaders have no reasoning if it comes to solving issues that can bring peace.Corruption ,tribalism and killing of civilians are the things they dream about.please friends, read the floods during Amin’s Regime and the animal farm.These books are depicted in South Sudan.All leaders from Kiir to his governors must step down so that new elections be conducted.